This article was originally published in Creation/Evolution, Issue XIX (Winter 1986-87) by the National Center for Science Education, and is reprinted by permission of Dr. Brace. Dr. C. Loring Brace is professor of anthropology at the University of Michigan and curator of physical anthropology at the university's Museum of Anthropology. He is a leading authority on human fossils and evolution. The Middle Pleistocene stretch of time - what I have called the "Pithecanthropine Stage" of human evolution (Brace, 1979) - is a fascinating period to anthropologists and is of interest here for two main reasons. First, the pithecanthropines represent a splendid characterization of life forms that are evolutionarily intermediate between apes and humans; and, second, the pithecanthropines have brought forth pronouncements from creationists that are so blatantly contrary to fact that some kind of public effort is necessary simply to set the record straight. For that million-year stretch of time between about 1.5 million and 500,000 years ago, the only kind of hominid for which we have any evidence is a form that most anthropologists now refer to as Homo erectus. The first such specimen was discovered in Java nearly a century ago by Dutch physician and anatomist Eugene Dubois who labeled it Pithecanthropus erectus. Modern appraisers usually do not feel that it is distinct enough from Homo to warrant a separate generic name, but Dubois' species erectus is accepted by nearly all. One "modern" appraiser who has rejected Dubois' initial claims and more recent assessments of his Java finds is Duane Gish. Curiously, in this matter he is not supported by the director of his own institute, Dr. Henry Morris, who declared that "Homo erectus was a true man, but somewhat degenerate in size and culture" (Morris, 1974:174). In contrast, Dr. Gish has concluded, "We believe that the claim for a manlike status for Pithecanthropus should be laid to rest" (Gish, 1979:127). The dilemma of the creationists, of course, is the fact that their own preconceptions require them to categorize something as either ape or human. When they actually encounter a creature that is in between, then they have to throw it in one or the other of the modern categories, and it is not surprising that a form with genuinely intermediate features should be randomly assigned to each of the only possibilities they will accept. From the point of view of their own logic, they are both equally correct. From an examination of the actual evidence, they are both demonstrably wrong. It should be instructive to spend a moment and find out why Gish has reached the conclusion of his choice. There are two ostensible reasons. First, he raises a matter which he claims illustrates why Dubois' own findings are not to be believed. Toward this end he states, "Dubois concealed the fact that he also discovered at nearby Wadjak and at approximately the same level two human skulls (known as the Wadjak skulls) with a cranial capacity . . . somewhat above the present average" (Gish, 1979:124-125). He suggests that Dubois withheld publication until 1922 since otherwise his "Java Man" would not have been accepted as a "missing link." The same point is made by a number of other opponents of evolution, one of whom suggests that Dubois' action amounted to "a practical confession of fraud" (Kofahl and Segraves, 1975:127). As Gish has noted, "His failure to reveal this find to the scientific world at the same time he exhibited the Pithecanthropus bones can only be labelled as an act of dishonesty" (Gish, 1979: 125). To put the matter straight, "nearby Wadjak" is a good one hundred miles of mountainous countryside away from Trinil, the site of Dubois' Pithecanthropus. Nor is it accurate to call them "approximately the same level" when one is well over half a million years old and the other is less than ten thousand. Finally, Dubois did publish preliminary accounts of his Wadjak material in 1889 and 1890 before his Trinil discoveries were even made, and he recapitulated these in print in 1892 before becoming involved in what he correctly realized was the far more significant Pithecanthropus issue. If there is a question of honesty involved, it has nothing to do with Dubois. The second reason why Gish has questioned the status of Dubois' discovery has to do with anatomical assessment. Relying upon the appraisal published by Boule and Vallois in the third edition of their venerable tome, Fossil Men , Gish repeatedly refers to the Trinil skull as apelike and notes that if only the skull and teeth had been found the creature would have been regarded as closely allied to, if not identical with, the Anthropoids (Gish, 1979:126). In regard to the dentition, Gish has stated that "Every characteristic of these teeth given by Boule and Vallois is simian rather than man-like" (Gish, 1979:126). One should realize, however, that the "every characteristic" in Gish's phrase only refers to those characteristics that were simian and not to the many which they discuss that were not. Boule and Vallois sum up their appraisal of the teeth, noting, "All these facts provide singularly unambiguous confirmation of those that emerged from a study of the cranium" (Boule and Vallois, 1957:122). Now then, what was it that they actually concluded from a study of the cranium? Not what Gish has claimed at all. In their words, "In its principal characters, the Trinil skull-cap is really intermediate between that of an ape, like the chimpanzee, and that of a man of really low status, such as Neandertal man" (Boule and Vallois, 1957:118). 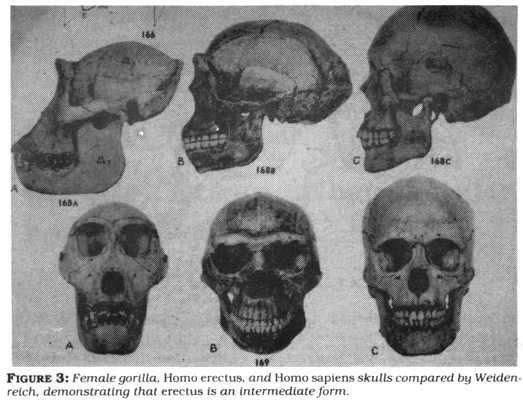 This is the full development of their appraisal of Dubois' famous Pithecanthropus; it is graphically illustrated in the photograph in their book (1957:119, fig. 75); and it is what most anthropologists now accept. In this photograph, the figure on the left is a chimpanzee skull and that on the right is the skull of a Neandertal of about fifty thousand years ago. In the middle, and obviously half way between in form and dimensions, is the original Pithecanthropus. Now if the creationists have been less than reliable in their appraisal of the first of the Middle Pleistocene hominids discovered, their treatment of the most extensive collection of evidence - that found in China from the late 1920s through the 1930s - is even more bizarre. Their writings display a trail of distortions, personal innuendos, and outright falsehoods that have no faint kinship with anything that can be called science. Gish, for example, has gone on record as saying. "A close examination of the reports related to Peking Man, however, reveal a tangled web of contradictions [and] highly subjective treatment of the data" (Gish, 1979:127). Gish intends this statement to apply to those who did the original work in China, but, as we shall see, it is a description only of his own writing and that of a few others whose primary commitment is to sectarian religious dogma rather than to verifiable reality. Let us, then, look at the facts of the matter and compare them with what has been said about them. The discovery of a few hominid molar teeth in Middle Pleistocene cave deposits at Choukoutien, just under fifty kilometers southwest of Beijing, stimulated Dr. Davidson Black, a Canadian-born professor of anatomy at Peking Union Medical College, to declare that they were evidence for the presence of a prehistoric population which he labeled, in splendid polysyllabic Latin, Sinanthropus pekinensis (Black, 1927). This led to systematic excavation of the deposits at Choukoutien. 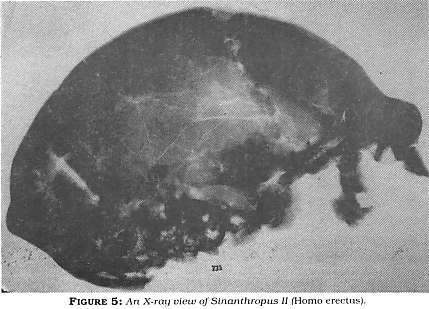 Two years later, in 1929, the field season was rewarded by the discovery of a complete and undistorted skull of Black's Sinanthropus. Since this presented a fine mixture of human and anthropoid apelike features, Black felt that his earlier prediction and naming of a new type of hominid fossil had been perfectly justified. After careful consideration of his evidence and the subsequent discoveries at Choukoutien over the next seven years, anthropologists have concluded that Black's work was a model of scientific application but that the new name was not warranted. The temptation to give dramatic fossil discoveries new and different names is an occupational hazard to which many a fossil finder has succumbed. Just within the past few years, we have had some modern examples of this in the highly publicized clash between Richard Leakey and Donald Johanson. But it does not mean that there is necessarily any doubt concerning the nature or even the significance of the material being discussed. It is often just a matter of what we decide to call it. Names are given by people for their own convenience, and, if different scholars do not agree upon what to call a particular find, this does not mean that they are not talking about the same thing or that there is anything wrong with their descriptions. Immediately after the discovery of the Choukoutien skull in 1929, Davidson Black telegraphed the head of the Institute of Human Paleontology in Paris, Marcellin Boule, to give him a synopsis of the discovery. He also sent photographs, measurements, and a preliminary descriptive account along with his interpretation. Boule then used this as the basis of his own report to the readership of the French journal, L'Anthropologie. The only difference between what the two concluded was the fact that Boule felt that, in spite of a series of less primitive features, the fossil belonged in the same category as Dubois' Pithecanthropus while Black felt that it deserved his new genus and species name. History has sided with Boule and even gone one step further. Both the Chinese and the Javanese specimens are now regarded as belonging to the same species, erectus, and their genus is accepted as being the one that includes modern human beings, Homo. The fact that Boule did not agree with Black on the new name and that most subsequent scholars have agreed with Boule has led Gish to accuse Black of coloring "the facts to fit his scheme" (Gish, 1979:136). Gish then continues with the completely gratuitous slur, "What confidence can we have, therefore, in any of the descriptions or models of Sinanthropus from the hand of Dr. Black?" (Gish, 1979:136). 1 shall later demonstrate why it is that this accusation is without foundation. In 1934, Davidson Black died suddenly after his preliminary publications had appeared, and his place was taken by Franz Weidenreich, a refugee from Hitler's Germany, who produced the definitive monographs on the fossils found at Choukoutien. These were not done without a hitch, however, because the Japanese invasion of China forced Weidenreich to flee to America before his work was finished. He took his photographs, notes, measurements, and a well-made series of casts, but he left the original fossils in Beijing. Later, these, too, were slated to be sent to America for safe-keeping, but the day they reached the Chinese port of embarkation was December 7, 1941, the day the bombs fell on Pearl Harbor. The ship on which they were to be sent was sunk, and the American marine detachment, in whose luggage they were being carried, was captured by Japanese soldiers. The fossils have never been seen since. Fortunately, we still have the admirable publications of Black (1931; Black et al., 1934) and Weidenreich (1936, 1937, 1941, 1943) and the casts and models prepared under Weidenreich's direction. We can regret the loss of the originals, but the information which they represented is now the property of all who can read. This, however, is repeatedly denied by Gish, who directs the same kind of accusations toward Weidenreich that he earlier had made toward Black. A healthy skepticism is a necessary part of scientific practice, but, when it goes to the extent of alleging fabrication on the part of particular investigators, it should be backed up by unimpeachable evidence. In the present instance, as we shall see, this is just not the case. Gish does concede that, if Weidenreich's work is accepted as presented, then the Choukoutien material would indeed qualify as a legitimate intermediate between ape and human status. "If one accepts uncritically Weidenrich's model of Sinanthropus as a true portrayal of the real Sinanthropus, then he could hardly reject the . . . appraisal . . . that Sinanthropus occupies a position intermediate between anthropoid apes and man" (Gish, 1979:137). Gish would have us believe that the entire surviving corpus of evidence for the existence and form of Sinanthropus is contained in the model or models constructed by Weidenreich, despite subsequent fossil finds. Having set up this strawman, he then denounces it without ever looking at the evidence upon which it is based. This he does with the words, "I consider these models of Weidenreich to be totally inadmissible as evidence related to the taxonomic affinities of Sinanthropus," concluding with, "If such a case were ever brought to court there would not be the slightest doubt that such hearsay evidence would be ruled inadmissible" (Gish, 1979:138). The only thing he offers to support his contention that Weidenreich is not to be believed is his repeated allegation that the conclusions of Weidenreich, and others as well, are supposedly at such variance with earlier work. As he claims, "This model is so glaringly different from the earlier description of Sinanthropus . . . that I strongly suspect Weidenreich was guilty of the same lack of objectivity and preconceived ideas that motivated Black" (Gish, 1979:136). This same charge of a supposed difference between earlier and later accounts of the form of Sinanthropus is also leveled at his principal source of information, the 1957 text by Boule and Vallois, Fossil Men. In Gish's words, "The account of Boule and Vallois in this section varies so decidely from earlier descriptions of Sinanthropus, published elsewhere by Boule, that it is probable that this section was written by Vallois after the death of Boule" (Gish, 1979:136). Presumably, Boule's original description was more to be trusted because, as Gish claimed, "Boule had visited Peking and Choukoutien and had examined the originals" (Gish, 1979:133). This, however, is pure invention. Boule did not visit Peking, he did not visit Choukoutien, and he never saw the original specimens. Instead, as he made quite clear in print, he relied entirely upon the photographs and information furnished to him initially by Black and later by Weidenreich. I have already shown that the earliest account of Sinanthropus written by Marcellin Boule differs from that of Davidson Black not in its description of the evidence but only in the name by which it is called. The only other separate account written by Boule appeared seven years later. Gish quotes from this to justify his conclusion that the Sinanthropus specimens were "monkey-like" creatures who could not have been human ancestors because they were being hunted and eaten by "true Men" (Gish, 1979:134, 140). This is not my own translation but is taken directly from that "extensive section" on Sinanthropus in the English edition of Fossil Men, which Gish suggests was written by Vallois after the death of Boule. It is faithful to the letter to Boule's rendition of twenty years earlier. In fact, if one goes through Boule's 1937 paper, section by section, paragraph by paragraph, and line by line, and compares it with the relevant segment in Fossil Men, it is evident that Vallois made only very minor editorial changes for the final version. The supposed differences in the earlier and later accounts of the nature of the material discovered at Choukoutien are simply a fabrication by Gish designed to cast doubt on the work of some of the most respected students of the human fossil record. It is the creationist position, then, and not the work of Black or Weidenreich, which should be regarded as based, at best, on hearsay evidence when not grounded in demonstrable falsehood. The charge that the evidence for evolution would be ruled inadmissible in court is actually an example of Orwellian "newspeak." In the 1982 Arkansas court decision, it was the creationist viewpoint that was shown to be without merit. Now let us turn to a consideration of the evidence itself. Despite Gish's claim that the only surviving evidence for the form of Sinanthropus is Weidenreich's model, we have the series of profusely illustrated monographs by both Black and Weidenreich to draw upon, to say nothing of the quantities of material discovered since World War II. 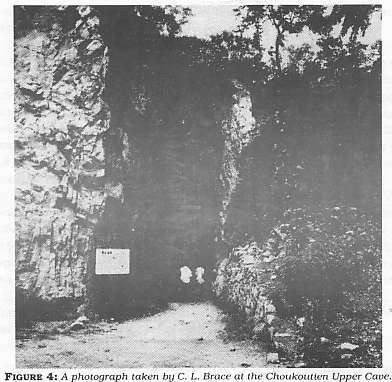 Gish has even written that not just the fossils but the very site is a hoax: "There is serious doubt that a cave existed at either level" at Choukoutien (Gish, 1979). FIGURE 4 records my 1980 visit to excavations at these "nonexistent" caves. Creationists have consistently misunderstood or misrepresented the nature of the fossil record of human evolution. They have tended to vacillate between denying the evidence and trying to force selective parts of it into easy categories of ape (or monkey) and human (meaning modern human), despite the fact that we humans have rather diligently and successfully sought out our fossil ancestry. Let us refer to some of the specific evidence. FIGURES 3 through 7 show some of the massive amount of evidence unearthed at Choukoutein. Compare them with claims that no such evidence exists. If the early discoveries are forgeries, how could the internal structure of a fossil have been faked? FIGURE 5 is an X-ray view of one of the early crania showing intricate anatomical details. FIGURE 6 is an external view. 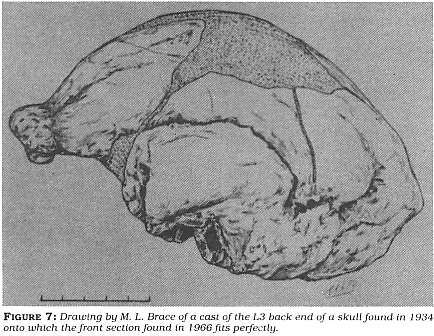 The back part of a skull found in 1934 (L3) fits perfectly with a front portion found in 1966 (FIGURE 7). Homo erectus remains are known from Africa, Asia, and Europe. Late examples grade into early Neandertal forms (some scholars even treat Neandertal as late erectus). In summary, Homo erectus is a well-documented, well-dated, and widespread hominid intermediary fossil antedating Homo sapiens. Black, Davidson. 1931. "On an Adolescent Skull of Sinanthropus Pekinensis in Comparison with an Adult Skull of the Same Species and with Other Hominid Skulls, Recent and Fossil. " Palaeontologia Sinica, Series D. 7: 1 -111. --- 1927. "On a Lower Molar Hominid Tooth from the Chou Kou Tien Deposit." Palaeontologia Sinica, Series D. 7:1:1-28. Black, D., Teilhard de Chardin, P., Young, C. C., and Pei, W. C. 1934. "Fossil Man in China: The Choukoutien Cave Deposits with a Synopsis of Our Present Knowledge." Memoirs of the Geological Survey of China, Series A. 11:1-166. Boule, Marcellin. 1937. "Le Sinanthrope." L'Anthropologie. 47:1-2:1-22. --- 1929. "Le Sinanthropus." L'Anthropologie. 39:455-460. Boule, Marcellin, and Vallois, Henri-Victor. 1957. Fossil Men. Translated by Michael Bullock. New York: Dryden Press. Brace, C. Loring. 1979. The Stages of Human Evolution. 2nd. ed. Englewood Cliffs, NJ: Prentice-Hall. Dubois, Eugene. 1922. "The Proto-Australian Fossil Man of Wadjak, Java." Proceedings Koninkli/ke Akademie van Wetenschappen te Amsterdam. 23:1013-1051. --- 1892. "Palaeontologische onderzoekingen op Java." Jaarboek van het Mijnwezen in Nederiandsch-Indie over het jaar 1890-1891. Mededeelingen, pp. 60-6 1. --- 1890a. 'Wergadering der Directie, gehouden op March 14, 1889." Natuurkundiq Tijdschrift van Nederlandsch Indie Deel XLIX. Achste Seric 10:209-211. --- 1890b. "Palaeontologische onderzoekingen op Java." Verslag van het Mijnwezen in Nederlansch-Indie. 2 Kwartaal, pp. 18-20; 3 Kwartaal, pp. 12-15. Gish, Duane T. 1979. Evolution: The Fossils Say No! 3rd. ed. San Diego, CA: CreationLife Publishers. Johanson, Donald C., and Edey, M. 1981. Lucy: The Beginning of Humankind. New York: Simon and Schuster. Johanson, Donald C., and White, T. D. 1979. "A Systematic Assessment of Early African Horninids." Science. 203:321-330. Kofahl, Robert E., and Segraves, Kelly L. 1975. The Creation Explanation. Wheaton, IL: Harold Shaw. Morris, Henry M. (ed.) 1974. Scientific Creationism, Public School Edition. San Diego, CA: Creation-Life Publishers. Weidenreich, Franz. 1943. 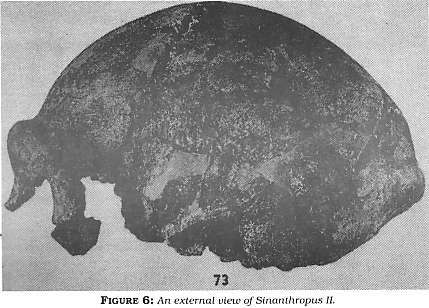 "The Skull of Sinanthropus Pekinensis: A Comparative Study on a Primitive Hominid Skull." Palaeontologia Sinica, Series D, Whole Series No. 127, pp. 1-484. --- 1941. "The Extremity Bones of Sinanthropus Pekinensis. " Palaeontologia Sinica, New Series D, No. 5, Whole Series No. 116, pp. 1-150. --- 1937. "The Dentition of Sinanthropus Pekinensis." Palaeontologia Sinica, New Series D, No. 1, Whole Series No. 101, pp. 1-180. --- 1936. "The Mandibles of Sinanthropus Pekinensis: A Comparative Study." Palaeontologia Sinica, Series D., pp. 1-132.